Sometimes it may be overwhelming to choose a sleeping bag. In this article we will go the things to consider when choosing a sleeping bag such as, temperature rating, the insulation material, and the weight. EN Comfort Rating (for Women): The lowest outside air temperature at which a standard woman can sleep comfortably in this bag. EN Lower Limit Rating (for Men): The lowest outside air temperature at which a standard man can sleep comfortably in this bag. Remember these ratings are based on the person wearing one layer of clothing, hat, and a sleeping pad. Now let’s address the temperature rating that you will need. This is fairly simple, just choose a bag with the lowest temperature rating that you think you are going to encounter. If you live in Southern California and don’t ever plan on venturing into the cold there is really no point to buy a -20° sleeping bag now is there, but on the opposite end if you live in Northern Montana and so venturing in the cold a lot a 20° bag is not going to cut it for you is it. I live in Utah and go winter camping at least a few times a year, right now I have a 0° bag and that usually works well most of the time. There are just a few times on super cold nights I have wished I had a warmer bag though. Another thing to consider is if you are an average sleeper or do you sleep warm or cold? If you sleep cold then you will want to consider getting a lower temperature rated bag. Clothing- what you wear in your sleeping bag can affect your temperature, make sure to wear clean base layers and new socks to sleep. 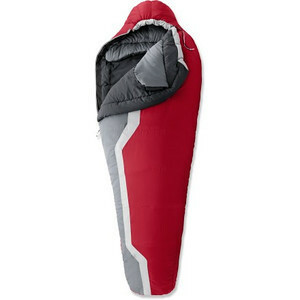 There are two types of insulation for sleeping bags, down or synthetic fibers. Each has their advantages and disadvantages. Down provides superior warmth, compresses better, and is incredibly durable. A down bag will be more expensive upfront but will last longer in the long run. Down bags are often lighter then synthetics. However you will want to avoid down if you are camping a wet, damp, or rainy trips, because as soon as it gets wet it loses its warmth. Synthetic provides excellent price value, and preform well in all climates dry or wet. Synthetic bags however are heavier then down. Choose synthetics if you know there is a possibility of getting wet or want the best bang for your buck. Synthetics however will never match the warmth or comfort of down. In my experience down was the warmest and most comfortable but you will pay a price for it. As technology has evolved the weight of sleeping bags has greatly decreased. When choosing a sleeping bag it is good to consider the weight of it. First of we need to look at you intended use. Are you just going car camping or are you going to be backpacking. If you are car camping you don’t really have to worry about weight, but if you are backpacking you for sure don’t want to take a giant 6 lb. sleeping bag. The lighter weight sleeping bags are going to have a larger price tag on it though. As I addressed before down is lighter then synthetics. One thing you want to consider though is do you want to sacrifice a few ounces for comfort and warmth, I wouldn’t that’s up to you. Throw a water bottle with hot water in the bottom of your bag, put a sock around it to keep it from burning you. This entry was tagged Backpacking, Camping, Gear, How To, Sleeping Bags. Bookmark the permalink.